If you have been watching CNN's coverage of the Republican debate, you saw this image a few moments ago. At left is Wayne Newton. Center is Donald Trump. 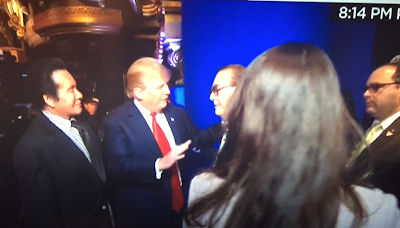 At right, talking to Trump, is Donald's best friend, Phil Ruffin. Phil, from Wichita, owns The TI Hotel, part of the Trump Hotel in Las Vegas and many other properties. Phil is a billionaire in his own right. Why do I bring this up? Phil will be the special guest speaker at the annual banquet of the Wichita Independent Business Association on January 19. And, yours truly will have the privilege of introducing Mr. Ruffin for the evening.